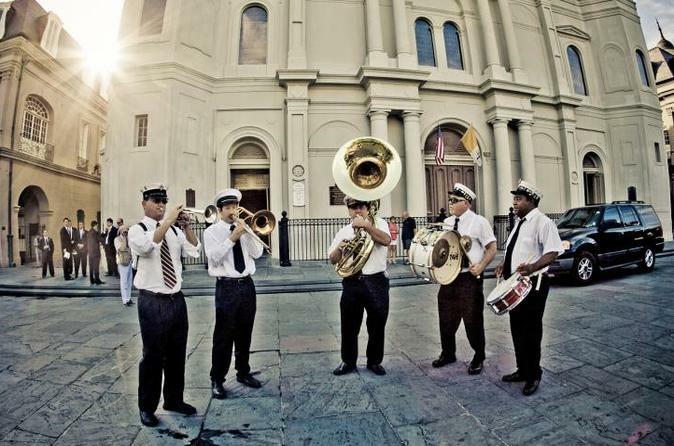 Get insights into the history of New Orleans during this private 2-hour walking tour. Travel through time, from the city's founding by the French, through its period under Spanish control, then briefly back to French rule before being acquired by the United States in the Louisiana Purchase. To add to the fun and entertainment of this tour guests will be allowed to stop in bars along the tour route and purchase a to go drink before the group heads out to the next location. Please keep in mind that some bars allow children inside however some do not. Begin in the heart of the French Quarter, where you'll meet your guide and begin learning about the city's history. From there, the group will explore Louisiana's complex culture and rich history, and experience that magical mystery that makes New Orleans so irresistible. Your guide will teach you the history of New Orleans, Louisiana starting with the city's development from its founding by the French, through its period under Spanish control, then briefly back to French rule before being acquired by the United States in the Louisiana Purchase. The tour guide will take guests to the location where the Louisiana Purchase was signed in 1803. Visit the location where the Spanish Government took a stand to New Orleans citizens and sentenced the Rebel Army to death. The bodies of the men in Rebel Army were to be laid out in the dirt in front of the church for everyone to watch rot right in front of their eyes. Learn the history behind St. Louis Cathedral Church along with Jackson Square. During this tour, you will notice the beautiful architecture throughout the French Quarter that makes it so unique. Guests will be taught the differences about certain types of architecture found throughout the French Quarter. Guests will be taken to locations where Hollywood stars have decided to call the French Quarter home and visit locations where scenes from unforgettable movies have been filmed. Pirates, prostitutes, convicted felons all helped found the city of New Orleans. Visit mass burial grounds that were used during the yellow fever epidemic and learn how yellow fever, fires, and hurricanes almost wiped the city out multiple times. Learn about the casket girls who were brought over on a ship to live with the Ursuline nuns. The Ursuline nuns were supposed to teach these young women how to be good wives and mothers. They were supposed to help populate the city. Instead, within one year after they arrived the death rate doubled. Visit the city's dueling grounds, where men would go and fight to their death. Learn about New Orleans' traditional burial practices and how they are different than most. Find out why New Orleans has above-ground cemeteries along with how and why the same vaults are recycled over and over again. This tour will also stop at many of the attractions and National Historic Landmarks that this city has to offer along the way.